If you like small jazz guitars, here are four that are among the smallest jazz guitars available (as judeged by width of the lower bout). These cover a range of prices and include mass-produced, easily found models and higher-quality luthier made guitars. I’m fond of smaller-than-standard-sized archtop, hollow body, jazz guitars. 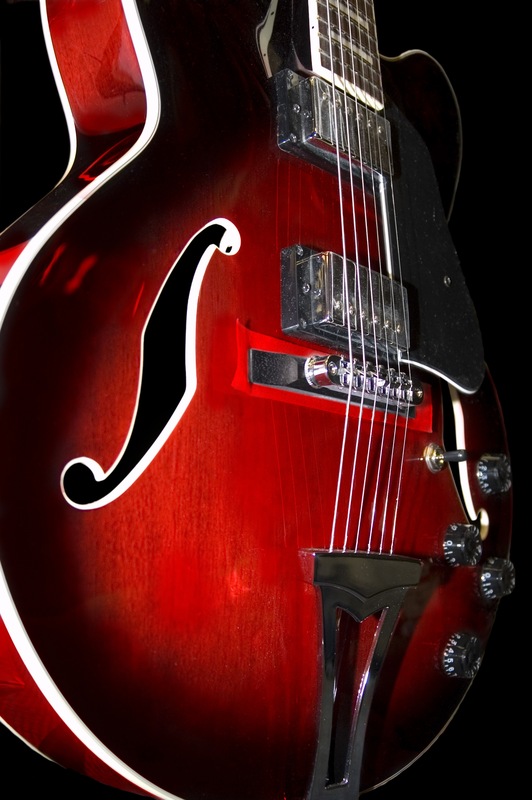 Archtop guitars were invented by Gibson and before amplification grew to be as wide as 18 inches. The larger the body, the louder the guitar. But electric guitars don’t need large bodies to be loud. Still, 16 and 17 inch archtop jazz guitars continue to be the standard. There’s nothing wrong if that’s what you like. But I find smaller body guitars to be more comfortable. Acoustically, small archtops are not going to have as much sound as larger guitars. And if the top is a laminate instead of solid wood, there will be further compromises to the unplugged tone. Still, you may find these to be both more comfortable and sound just great. Tone is after all, a personal preference. These four guitars all have lower bout widths under 15 inches. Each of the above models has related models with slightly different features and prices. The smallest of the guitars is the Eastman El Rey ER2. Eastman has made three other models in this series. They are the ER0, ER1, ER2 and ER3. I have featured the ER2 because it has dual humbucker pickups, a trapeze bridge and a solid spruce top. It is a thin body guitar with no f holes. The hollow body with solid top gives the guitar better acoustic sounds than you might expect while the absence of sound holes helps prevent feedback when plugged in. The Ibanez AG95 is a mass produced archtop guitar. It is made from laminated woods. Bubinga is an unusual choice for wood. It is not endangered. It is used as an alternative to rosewood. There is a less expensive model than this in the AG line but I thought showing the more expensive model was appropriate considering the prices of the other guitars. The Benedetto Bambino is from the respected archtop luthier Robert Benedetto. This is the most expensive of these small guitars yet is in fact the least expensive of the Bambino line. You can get solid-wood tops and carved-wood tops and guitars with deluxe appointments, all for more money. Although the body width is the same as the AG95, the guitar is most similar to the El Rey. Both are hollow body, thinline guitars without f holes. The Ibanez George Benson GB10 model is one of the most expensive archtops from Ibanez and certainly is in a different class from the AG95. Size wise it isn’t that different from the AG dimensions. There is at least one other George Benson model available from Ibanez – there have been others – but they are larger guitars than the GB10. Previous Post:How much does it weigh? How much does it matter? Weighty Guitars.